The 100 Men D.B.A. Hall, a longtime center of African American social life and entertainment, was built in 1922 by the One Hundred Members' Debating Benevolent Association. Over the years the association sponsored many events and also rented the hall to promoters who brought in blues, rhythm & blues, and jazz acts. Local residents have recalled performances by Etta James, Big Joe Turner, Guitar Slim, Irma Thomas, Professor Longhair, Ernie K-Doe, Deacon John, Earl King, and numerous others here. In the decades following the Civil War, African Americans throughout the South formed many fraternal and benevolent organizations in order to collectively increase their social, economic, and political power. The One Hundred Members' Debating Benevolent Association was incorporated in Bay St. Louis in 1894. According to its charter, "the purpose of this Association is to assist its members when sick and bury its dead in a respectable manner and to knit friendship." The charter stipulated that "the Association may from time to time give entertainments for the purpose of replenishing the treasury." Despite its name, the association was founded by twelve men, and the nature of its "debates" appears to be lost to time. (In other organizations, the initials D.B.A. often stood for Death and Burial Association.) By the 1950s the functions of many benevolent organizations were supplanted by insurance companies, although in New Orleans they have survived as social aid and pleasure clubs that organize annual parades. 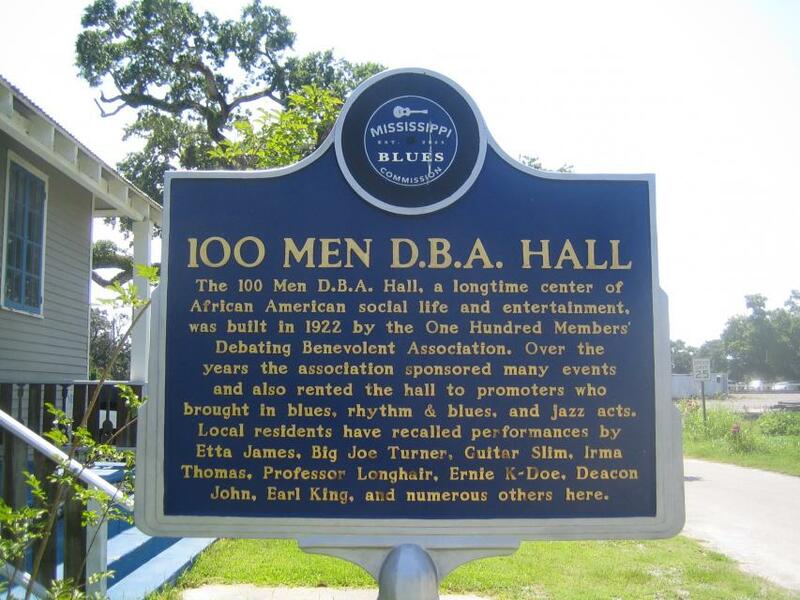 The Disabled American Veterans acquired the 100 Men D.B.A Hall in the mid-1970s. After Hurricane Katrina the hall was slated to be razed until Jesse and Kerrie Loya stepped in to purchase it in 2006. The Loyas restored it with the intent of creating a nonprofit community center and venue. It operates today as an ongoing live blues locale. As a resort community in the early decades of the twentieth century, Bay St. Louis was the site of performances by New Orleans jazz and dance bands, as well as local groups, including the Supreme Band and bands led by Paul Maurice, August Saucier, and Harry Fairconnetue (who played regularly at the Promo Benevolent Association Hall). Bay St. Louis natives Fairconnetue and Warren Bennett also worked in Clarence Desdunes' Joyland Revelers. Other local performers of the era included the Alexis family (Peter, Ricard, and Joseph), Edgar Benoit, Sumner Labat, Edward Palloade, Edgar Saucier, Oscar Collins, Eddie Thomas, Anderson Edwards, and Johnny Toncred. Famed New Orleans musicians Lorenzo Tio, Sr. and Jr. and Johnny and Warren "Baby" Dodds also lived in this area in the early 1900s. After World War II the 100 Men D.B.A. 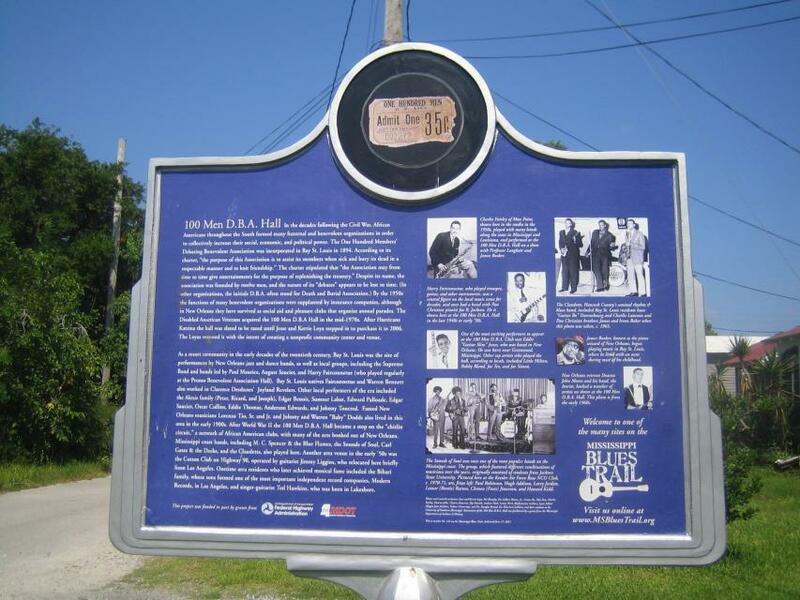 Hall became a stop on the "chitlin circuit," a network of African American clubs, with many of the acts booked out of New Orleans. 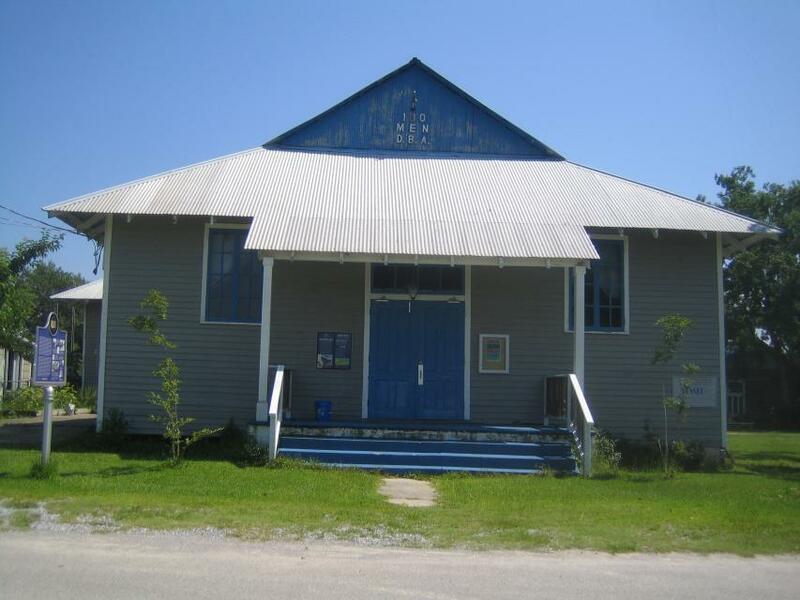 Mississippi coast bands, including M. C. Spencer & the Blue Flames, the Sounds of Soul, Carl Gates & the Decks, and the Claudetts, also played here. Another area venue in the early '50s was the Cotton Club on Highway 90, operated by guitarist Jimmy Liggins, who relocated here briefly from Los Angeles. Onetime area residents who later achieved musical fame included the Bihari family, whose sons formed one of the most important independent record companies, Modern Records, in Los Angeles, and singer-guitarist Ted Hawkins, who was born in Lakeshore. This marker can also be identified by its HM code. You can use the hashtag #HM1JA1 in tweets, and any other place where you might refer to this marker, including when searching on this site.